A turkey burger is a healthy meal option that's made with a combination of light and dark meat. 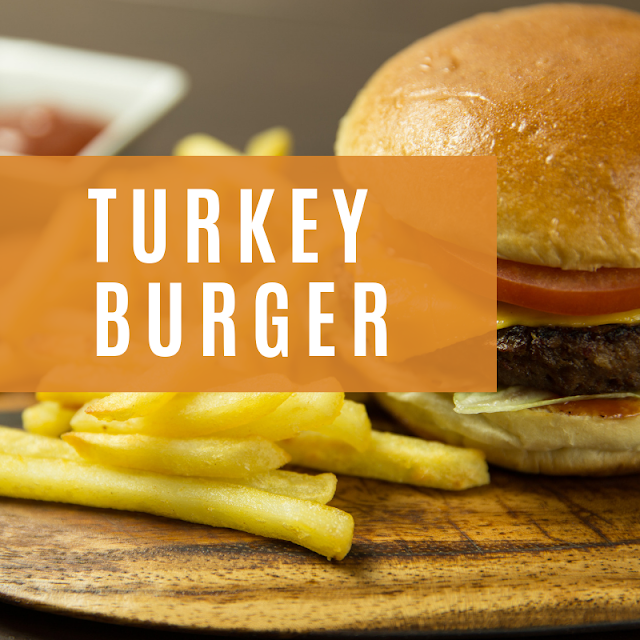 An average turkey burger patty has around 190 calories and under 15 grams of fat. When a turkey patty is cooked and served as a burger, bold sauces and fresh veggies are always used to provide flavor. Although cranberry sauce, lettuce, and tomatoes can enhance a turkey patty, you can take a turkey burger to the next level by pairing it with tasty items. French fries with great seasonings can enhance the flavor of a turkey burger. In order to make tasty seasoned fries, you'll need many types of seasonings and a bowl. When you're selecting seasonings, try to pick spices that are commonly used during Thanksgiving. If possible, you should make fresh pepper by grinding peppercorns. Fresh peppercorns that are processed in a grinder provide a bolder flavor than pepper that's manufactured in a can. If you're going to pour BBQ sauce on your turkey burger, you should eat it with a side dish that has a flavor that doesn't overpower the smoky BBQ elements. The best product for this task is a can of beans because every bean is smoothed in a bold sauce. These are just some of the many products that you can enjoy with a hardy turkey burger. If you're going to cook a processed turkey products, you should always buy patties that are provided by the best frozen turkey burger brand.